Meet Sulura, a woman who transitioned from selling maize flour to owning her own restaurant. Now she wants to share the secrets of her success with other women entrepreneurs. Sulura used savings from her maize flour sales to invest in higher margin goods and services, finally opening her own restaurant. At TechnoServe, we are lucky to be able to speak to many women with incredible stories. Recently we met Sulura, a woman in Nampula, Mozambique, as part of a study of women entrepreneurs, funded by the ExxonMobil Foundation under the Business Women Connect program. Sulura is a strong, charismatic woman who, upon seeing us talking to women in the market, approached us and demanded that we include her story! We were glad she did, as Sulura’s story is a classic example of women’s economic empowerment in action. Many women in Mozambique experience significant barriers to business growth. The same day we met Sulura, we met a family of three generations of women – Rosa, her daughter, Ana Rafael, and Ana’s newborn daughter – who have been selling maize flour in the same market spot for 20 years. They buy maize from a nearby farm and process it at a local mill. Sulura told us that she also began her business journey by selling maize flour in the market. However, instead of sticking to flour, she carefully saved her profits and used these savings to buy fish and shrimp to sell at the market. After a while, she invested in a small stove and started to sell cooked fish, improving her margins and reducing her inventory waste of spoiled fish. 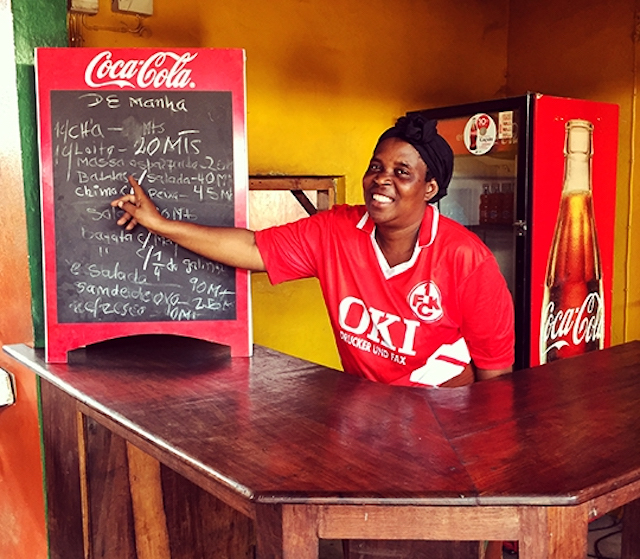 Eventually, Sulura had saved enough money to build a small restaurant in the market. Sulura came to realize that whenever her business had “grown up,” it was time to “grow out” into something more profitable. Rosa (left) and her daughter, Ana Rafael (right) have been selling maize flour for 20 years, facing the same challenges as many women who struggle to transition to higher margin goods. Sulura’s story demonstrates the transformative power of savings for women. Even very small-scale entrepreneurs can usually set aside a few cents per week, which can be used to grow and diversify inventory, switch to higher value products or invest in basic technology (in Sulura’s case, a stove). 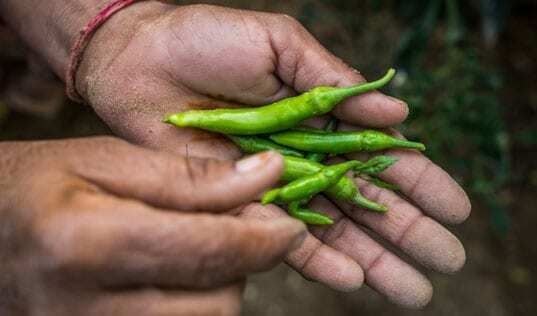 These investments often lead to increased business sales and profits, which result in higher self-reliance and economic empowerment. However, women entrepreneurs often miss out on these growth opportunities due to constraints with saving money. TechnoServe’s research shows that their savings are typically informal and have a short-term orientation. Many women in Mozambique store their money at home, where it is at risk of theft – a frequent occurrence for the women we spoke with. 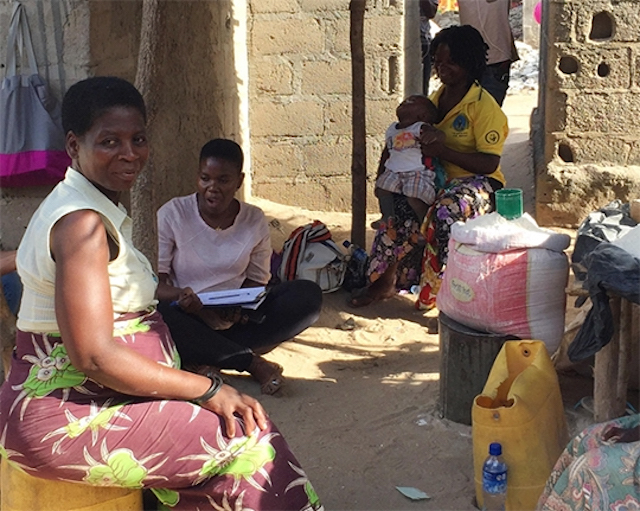 In the capital city of Maputo, women seeking more security often turn to market savings collectors. Rather than enabling the women to earn interest on their savings, these collectors charge a monthly fee to store their money for them. When women do save, their savings are primarily used to cover cyclical household expenses. With the exception of purchasing inventory and covering transportation costs, most women don’t invest a large share of their savings in their businesses. According to research by the Center for Global Development, women need access to individual, safe and reliable savings mechanisms in order to realize savings’ full potential for economic empowerment. Financial products that require an explicit savings commitment – for example, in the form of a term account – are particularly effective. Thanks to the rapid uptake of mobile phones across Africa and other regions, mobile banking offers viable alternatives and complementary services to traditional financial products, accessible even by those at the bottom of the pyramid. However, many women in Mozambique lack adequate understanding of mobile financial services, and few women use them to their fullest potential. Under Business Women Connect, TechnoServe is working with mobile finance providers including Vodafone M-Pesa and Letshego to help women micro-entrepreneurs access and use mobile financial services to grow their businesses. 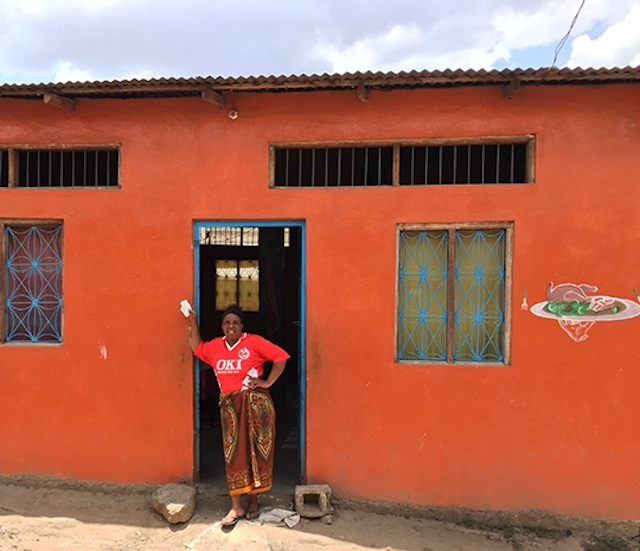 Sulura stands in front of her restaurant, located in the same market where she started off selling maize flour. Part of TechnoServe’s approach to women’s entrepreneurship is to encourage women to negotiate their right to succeed in business with their family, particularly including men in the conversation. Time and again, the successful businesswomen that we have met have partners who understand that when a woman can generate and grow her own income, the whole family benefits. Women’s confidence can grow when they see other women succeed. 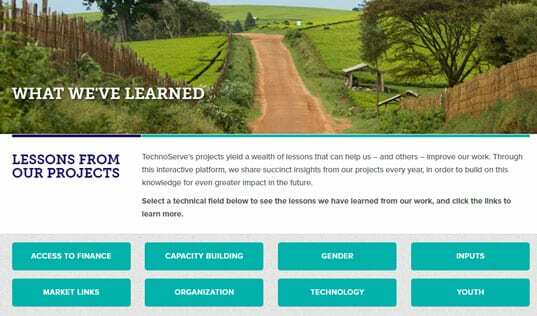 Under its Business Women Connect program in Tanzania, TechnoServe has developed videos and SMS-based storytelling from other successful women entrepreneurs. These positive stories help to motivate women to set their own goals and apply the business skills that they learn through TechnoServe training, including methods for saving and investing back in their businesses. Connecting with other successful women entrepreneurs also helps women envision themselves “growing out” to higher value products that are traditionally sold by men (in Sulura’s case, fish). Funded by the ExxonMobil Foundation and implemented in partnership with Vodacom, the World Bank’s Africa Gender Innovation Lab (GIL), and the Centre for Global Development, Business Women Connect (BWC) aims to increase women’s business income and economically empower female micro-business owners in Tanzania by introducing them to mobile savings and delivering business trainings. The partnership explores the intervention’s impact on women’s savings, business investment and business income. Launched in October 2015, BWC has worked with approximately 5,000 women in Tanzania. In 2017, BWC will reach approximately 3,000 more business women in Tanzania and will implement a pilot approach with 500 additional women in Mozambique.